About the Book Míle Míle i gCéin comprises a historical overview of the Irish language in Canada, including the pre- and post-famine periods, the decline of the language by 1900, and its limited modern revival. Historical notes on the state of the language in Ireland accompany the Canadian timeline to show the causes of the language's spread and decline. While much more widely spoken in Canadian society than has been previously acknowledged, following the Famine, the use of the language was deliberately hidden by its speakers from their children, with most of its history being obscured from the folk record within two generations. Included in original Irish, as well as through translation, are the scarce remaining accounts written in Irish Gaelic in and about Canada, including songs, poetry, and stories. A history of the spread, decline, and demise of the Irish language in Canada serves as a reminder of the tragedy of language loss, while also allowing for a richer understanding of Irish-Canadian culture, as well as of global Gaelic culture. 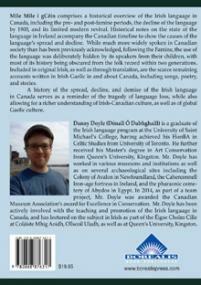 Danny Doyle is a graduate of the Irish language program at the University of Saint Michael's College, having achieved his HonBA in Celtic Studies from the University of Toronto. He further received his Master's degree in Art Conservation from Queen's University, Kingston. Mr. Doyle has worked in various museums and institutions as well as on several archaeological sites including the Colony of Avalon in Newfoundland, the Caherconnell Iron-age fortress in Ireland, and the pharaonic cemetery of Abydos in Egypt. In 2014, as part of a team project, Mr. Doyle was awarded the Canadian Museum Association's award for Excellence in Conservation. Mr. Doyle has been actively involved with the teaching and promotion of the Irish Language in Canada, and has lectured on the subject in Irish as part of the Éigse Cholm Cille at Coláiste Mhig Aoidh, Ollscoil Uladh, as well as at Queen's University, Kingston.